Blue Cross Blue Shield of Arizona just announced the grand-prize winner of its 2019 Walk On! Kids Cooking Challenge. 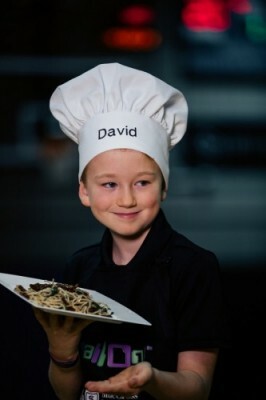 David Hummert, a 9-year-old from Sonoran Sky Elementary School in Scottsdale (pictured), was crowned the big winner for his "Broccolini Pasta," a pasta side dish featuring zucchini and broccolini. "I entered the Walk On! Kids Cooking Challenge because I have a really good pasta, and I wanted to win a new bike," Hummert said. "My Broccolini Pasta is filled with lots of good veggies, and it still tastes good! I can't wait for everyone to try it." As part of its effort to inspire kids to make healthier choices, in January, BCBSAZ invited kids between the ages of 9 and 12 across the state to submit ideas for healthy side dish recipes. Recipes had to be original, include at least one fruit or vegetable, and be able to be prepared in 20 minutes or less. "This year's recipe submissions were so diverse and creative, from deviled eggs stuffed with guacamole to carrots sautéed with dill and thyme, we just couldn't get over them," said Myrna Collins, Health Promotion Executive at BCBSAZ. "What I really like about David's Broccolini Pasta is that when it is made with whole-grain pasta, this is a yummy and nutrition dense dish comprised of a low glycemic veggies and whole-grain." As the grand-prize winner, Hummert received a new bike and accompanying safety gear. Recipe submissions underwent a three-part scoring process. First, a nutrition specialist reviewed all the recipe submissions and chose the top five finalists based on each recipe's nutritional balance between vegetables, fruits and other ingredients. Then the top five finalists participated in a public event at a Phoenix Suns home game, where game attendees had a chance to taste and vote for their favorite recipe. For the third part of the scoring process, videos of contestants discussing what makes their recipe so good were posted online for a public vote. The recipe that received the most points from all three scoring categories was declared the winner. MARION COLUM – a 10-year-old from Paseo Pointe Elementary School in Laveen for his Healthy Salad, chock full of delicious and nutrition-packed veggies like broccoli, cauliflower, tomatoes, and carrots. KATHERINE TIRRITO – a 10-year-old from St. Michael's School in Tucson who created the imaginative Portobello Pizza. NATE WALKER – a 10-year-old from Imagine Rosefield in Surprise for his creation, Carrots Galore, complete with flavorful ingredients like carrots, green onions, and dill. HANNAH WHITE – a 12-year-old from Abeka Academy in Wittmann who invented the protein-rich Hannah's Deviled-guac Eggs. The Walk On! Kids Cooking Challenge is part of the 14th annual Walk On! Challenge, a free month-long health and fitness challenge for schools held each year in February. With childhood obesity rates reaching epidemic proportions, BCBSAZ designed this program to motivate fourth- and fifth-grade students across Arizona to incorporate healthy habits into their daily routines for now and in the future. The Kids Cooking Challenge is a way to extend the Walk On! message outside the classroom. A peer reviewed study published in the journal Food and Chemical Toxicology examined the risk/benefit of consuming a diet rich in conventionally grown produce and pesticide residue exposure. That study concluded that if half of all Americans increased their consumption of a fruit and vegetable by a single serving each day, 20,000 cancer cases could be prevented annually. The study further concluded that the overwhelming difference between benefit and risk estimates provides confidence that consumers should not be concerned about cancer risks from consuming conventionally grown fruits and vegetables. A peer reviewed analysis published in the International Journal of Food Contamination concluded that dietary exposure to pesticides in the diet continue to be at levels far below those of health concern. "Consumers should be encouraged to eat fruits, vegetables and grains and should not fear the low levels of pesticide residues found in such foods." This paper provided updated estimates of dietary exposure to pesticides in the U.S. using Total Diet Study findings on pesticide residues. The United States Department of Agriculture (USDA) and the Federal Food and Drug Administration(FDA) sampling data consistently show that over 99% of produce have residue levels well below Environmental Protection Agency safety standards, if residues are present at all. Toxicologists with the University of California’s Personal Chemical Exposure Program determined that a child could literally eat hundreds to thousands of servings of a fruit or veggie in a day and still not have any health effects from residues. Their analysis illustrates how remarkably low any detectable residues are on produce. A peer reviewed study found that substitution of organic forms of produce for conventional forms does not result in a decrease in consumer risk because residue levels on conventional produce are so minute, if residues are present at all. Still concerned about residues? Simply wash your fruits and veggies. According to the FDA, washing is a healthful habit that often removes or eliminates any residues that may be present on organic and non-organic produce. Read, learn, choose but eat more organic and conventional fruits and veggies everyday for better health and a longer life. Once again, another year comes to an end. Many of us indulged in too many calories and too little sleep during the Holidays. It’s now time to take care of ourselves and appreciate the top commodities of health and time. Consumers now have more information than ever before on the importance of a healthy lifestyle. People now pay attention to ingredients, nutritional facts and health benefits of organic, natural, and super foods. Badia’s Health Center items have been a massive success producing many millions of dollars in new sales for the market. The success of the organic spices has expanded to many more, and has a complete range of products from Organic Olive Oil, Chia Seeds, Hemp Seeds, Trilogy, Flax Seeds, Kale Flakes, Organic Crystallized Ginger, Crystallized Aloe Vera, Organic and Lite Coconut Milks to a delicious new Tri-Color Organic Sesame blend. February is American Heart Month and a great opportunity to focus on your cardiovascular health. According to the American Heart Association, cardiovascular disease accounts for about one of every three deaths. Taking care of your heart starts with your diet and making healthy changes. Cutting down on sugar, which experts say most Americans consume far too much of on a daily basis, is the perfect place to start. Processed sugars add empty calories to your diet and can disrupt your metabolism, making weight loss or maintenance difficult and posing serious health risks. Americans on average get about 16 percent of their daily calories from added sugars, according to an Food and Drug Administration report, but the USDA’s dietary guidelines recommend less than one-third of that amount. And it’s not just the usual suspects like candy, cookies and cake that can cause the sugar surplus. “Foods like white bread and bagels break down the same as added sugar, so, it’s about the types of carbs you’re eating, too. In fact, I would say fats aren’t making us fat, sugar is.” says Dr. Arthur Agatston, founder of the South Beach Diet. To avoid extra sugar in your diet and get on a path to greater health, consider these simple strategies. • SHOP THE PERIMETER. Sticking to the perimeter of the grocery store is a good rule of thumb, as this tends to be where you’ll find the least processed foods, such as vegetables, fruit, dairy, meat and seafood, most of which are free of added sugar. • READ FOOD LABELS. Seek out foods containing little to no sugar, being careful to read labels. You may have to look hard though, as sugar is ubiquitous in American foods. Bear in mind that ingredient listings on packaged foods are in order of volume. • LEARN SUGAR’S OTHER NAMES. “Pretty much anything ending in ‘ose’ is a sugar. And whether it’s fructose, dextrose or sucrose, it will end up as a sugar in your body,” says Mandi Knowles, Registered Dietitian at South Beach Diet. Avoid them if you want to eat less sugar. • BUY UNSWEETENED FOODS. Look for food labels that say the food is unsweetened. Not “naturally sweetened.” Unsweetened. That means there won’t be anything lurking in there that could throw you off. • MAKE SUGAR SWAPS. 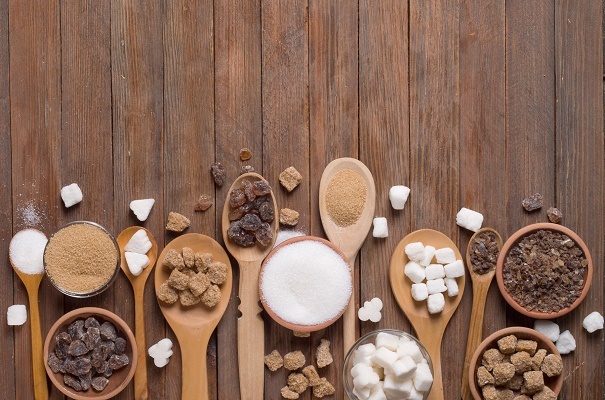 Simple swaps can help you save on sugar. Swap soda for unsweetened iced tea and save 31 grams of sugar. Swap non-fat flavored yogurt for Greek yogurt with fresh strawberries and save 19 grams of sugar. Swap your favorite vanilla latte for black coffee with a splash of cream and save 35 grams of sugar. • TRY SOMETHING NEW. 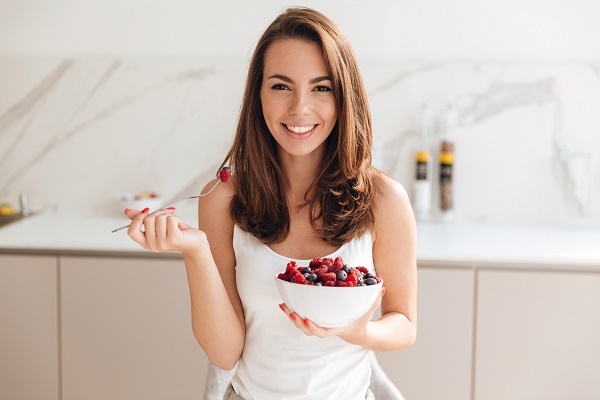 Consider a diet plan that focuses on good carbs, good fats, healthy protein and high fiber, such as the South Beach Diet, which is proven to have a positive impact on heart health, weight loss and belly fat. Delivering on average just 1 percent of calories from added sugars, it was the first plan to propose dieters focus less on cutting out fats and carbs and focus more on considering the quality of the fats and carbs they’re eating. New research reveals even America's healthiest eaters cave into indulgences based on their emotional states. Forty percent of U.S. food-brand lovers who rated their daily diet as extremely healthy agreed with the statement, "When I'm feeling down, I eat something indulgent to make me feel better." The study, conducted by full-service food branding agency, Foodmix Marketing Communications, breaks out a large group of brand lovers into smaller, differentiated and more actionable consumer segments. The proclivity to indulge happens in spite of the healthiest eaters' rigorous attention to how they eat in their majority lifestyles. Most (70%) care a lot about how their food is produced, and make sure to look for cleaner labels when food shopping (69%). Most (57%) purchase more expensive organic over non-organic food. Most (53%) are highly attuned to food news, and are among the first to react to food warnings and new nutritional recommendations. As to their favorite branded food product? Yes, most of them choose a health food over comfort foods and tasty treats. So what gives? In a food culture where most Americans are trying to eat healthier, the findings show that America's love affair with indulgent foods has reached even the most disciplined group of eaters. It's likely that members of this group need to give themselves "permission" to indulge, and may in fact turn indulgence food into a sort of self-care. Instead of hitting the gym after a bad day, many of these normally super-healthy eaters are hitting the refrigerator or nearest restaurant for an indulgent treat. "For those in the food business, the takeaway is that consumers' need to indulge has permeated the food culture, and is unlikely to diminish any time soon," said Bill Sherman, Director of Research at Foodmix Marketing Communications. "Even organic supermarkets and health-oriented restaurants should offer some indulgent foods, perhaps in smaller portions, to capitalize on the growing indulgent factor in America's food culture." 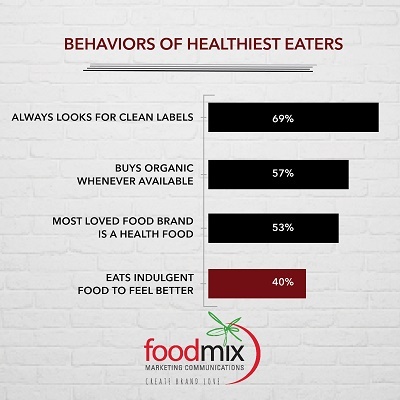 The newly released study builds off 2016 market research also conducted by Foodmix Marketing Communications to learn about consumers who love food brands. The 2016 Foodmix Marketing Communications Brand Love Attributes and Usage Study uncovered the extent to which consumers love food brands, the feelings and emotions that drive brand love, and the ways in which brand love impacts consumers' marketplace behaviors. The new study used a needs-based segmentation methodology to create six segments of brand lovers based on their unique combination of attitudes, preferences and behaviors. "We believe that the food renaissance – in which food is becoming a central part of our culture and being used by consumers to help define themselves – is driven by consumers who are passionate about food," said Dan O'Connell, CEO at Foodmix Marketing Communications. "For food companies, foodservice operators, and food retailers and distributors, we believe that the most desirable consumers are those most passionate about food brands. That's because these brand lovers behave in ways that directly impact a company's bottom line. Compared to other consumers, they are more loyal, more resistant to competitive offers and more likely to try brand extensions. They are also more willing to pay a premium and to advocate for your brand." Cramming cranberries into your holiday fare may actually be a good thing. Not only are they red, ripe and full of unique, festive flavor, cranberries may also help by supporting cell function, which could lessen the number of flu symptoms. THE POWER OF POLYPHENOLS: Research conducted in healthy adults during cold and flu season suggests that the consumption of cranberry polyphenols may help improve T-cell function.1 It is believed that these cells may serve as a first line of defense against the flu. Based on a limited number of participants and self-reported data, there appeared to be a correlation between cranberry consumption, T-cell proliferation and a reduction in cold and flu symptoms; however, further research in the area is needed. VIRAL AVENGER: Can cranberry juice help to contain the infectious process of the flu? A preliminary cell culture study suggests that cranberry polyphenols can provide antiviral effects. It is believed they do this by preventing certain type A and type B strains of influenza viruses from attaching to host cells and causing subsequent infection. This study, while not conclusive, sets the stage for more research in that area. 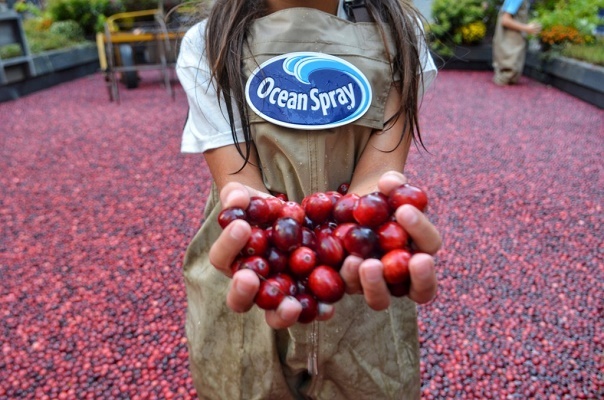 "For over 60 years, Ocean Spray has been committed to continuous research to further support the unique role that the cranberry plays in helping people live healthier lives," said Bobby Chacko, SVP, Chief Global Growth Officer at Ocean Spray Cranberries. "We are proud that we can provide a wide range of cranberry products that make it convenient for families to focus on their health year-round." Try the following tips that may help your health throughout the upcoming months: BUILD UP COLD IMMUNITY – The vitamin C in most Ocean Spray cranberry juices and juice drinks provides a nutritional immunity boost. Start the day with a fresh and fruity Superfruit Blend smoothie. KEEP WINTER WEIGHT GAIN AT BAY – Toast the holiday season or any celebration with your favorite mocktail or cocktail featuring Light Cranberry Juice Drink. Ocean Spray Light Cranberry Juice Cocktail serves up the unique health benefits of cranberry, with 2/3 fewer calories and carbs than most juices and alcoholic drinks. DRINK TO YOUR HEALTH – Hydrating is important no matter what time of year. Ocean Spray Pact cranberry infused water, available in six exciting flavors, can give you the pop you need to perk up any long winter day. Pact infused water may be the perfect way to help offset those hot beverages you'll be drinking, some of which could be dehydrating. 1 Nantz, MP et al. Consumption of cranberry polyphenols enhances human gammadelta-T cell proliferation and reduces the number of symptoms associated with colds and influenza: a randomized, placebo controlled intervention study. Nutrition Journal 2013; 12:161. 2 Oiknine-Djian, E et al. High molecular weight constituents of cranberry interfere with influenza virus neuraminidase activity in vitro. Planta Med 2012; 78: 962-967. 3 Wang, X et al. 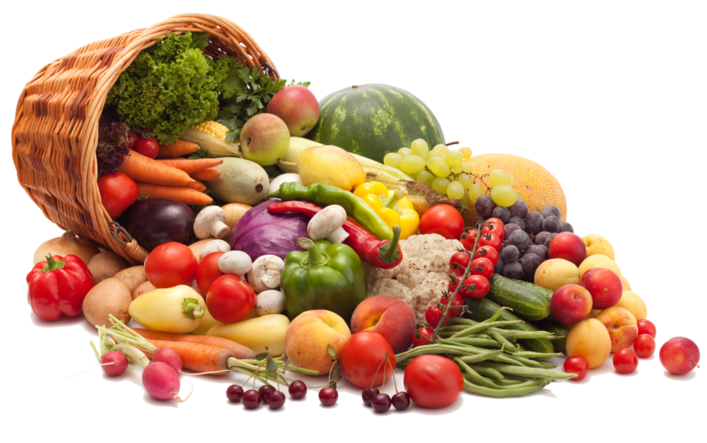 Fruit and vegetable consumption and mortality from all causes, cardiovascular disease, and cancer: systematic review and dose-response meta-analysis of prospective cohort studies. BMJ 2014; 349:g4490. Is your fitness routine stuck in a rut? Searching for ways to spend more time with your family? Why not combine these goals? There are a variety of ways to lead an active lifestyle that are suitable for the whole family and can include children of all ages. Let these four creative ideas help you turn each day into an opportunity to get fit and have fun as a family, without stepping foot into the gym. As with any workout, it’s important to have the proper gear, and that starts with footwear. So, each exercise below has a suggestion of what to look for when it comes to choosing the right shoe. PARTICIPATE IN A CHARITY RUN/WALK: Whether you’re a seasoned runner or have just signed up to run your first 5K, many fundraising races accommodate the entire family. For younger children, look for events that allow jogging strollers or that host a Fun Run. Events that show the importance of communities working together for a larger cause can provide a bonus to the fun. Shoe to try: Nike, Adidas and Converse all have a variety of “updated classic” styles available in men, women and children’s sizing, so that every family member can find a pair that reflects their personalities, while also providing necessary support for race day. OUTDOOR ACTIVITIES: Heading outdoors to go camping or hiking burns calories, while providing incredible views and memories. Shoe to try: Built to go off-roading, ASICS hiking shoes features reversed lugs on the outsole to ensure a dependable grip both uphill and downhill. HIIT: High-Intensity interval training is being incorporated into a lot of workouts these days. HIIT workouts alternate a quick, intense period of exercise, such as running or cycling, followed by a short, active recovery. Shoe to try: A lightweight cross training shoes with a stable base -- such as a Nike Flex Trainer -- are a good selection when it comes to HIIT workouts. BODYWEIGHT TRAINING: The benefits of bodyweight training are seemingly endless. From pushups to squats, these exercises require no additional equipment and can be done anywhere and performed with many modifications. Get creative with your family by doing a circuit of your favorite bodyweight exercises in the park. Shoe to try: A shoe with a mesh and synthetic upper material is designed to keep feet cool. Find this feature in a style, such as the New Balance, which also have special midsoles to ensure comfort from start to finish. New footwear is a great way for each family member to show his or her style, while getting motivated to meet fitness goals. Once you’ve got the plan in place, get into a fitness routine that works for your family and stick with it. For a one-stop-shopping experience, visit the Athletic Shop at Rack Room Shoes in stores or online. 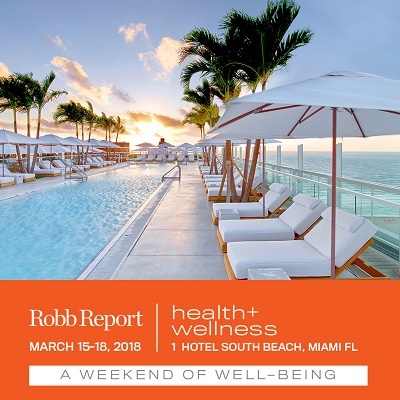 ROBB REPORT has announced its third annual Health + Wellness experience, taking place March 15–18, 2018, at 1 Hotel South Beach in Miami Beach, FL. Just in time for the upkeep of wellness-themed New Year's resolutions, the annual event returns with an enlightening, energetic, and educational program that features exclusive conversations with the leading minds in medicine and cutting-edge health, headlined by Dave Asprey, CEO and founder of Bulletproof. Acclaimed physicians from some of the nation's top wellness institutions, alongside a collective of fitness experts—including Steve Jordan, trainer to the stars; George Foreman III, former pro boxer and founder of EverybodyFights; and Pilates guru Erika Bloom—round out the weekend's roster of featured talent. 1 Hotel South Beach will serve as the idyllic setting for the weekend of wellness, situated alongside 600 feet of pristine white-sand beach on the Atlantic Ocean. With a farm stand in the lobby and carefully placed remixes of recycled and repurposed woods, preserved moss, petrified branches, and driftwood, the 18-story landmark on Collins Avenue has been revolutionizing sustainably chic design in Miami since it opened its doors in March 2015. "We've seen a growing awareness nationally that good health remains our greatest individual wealth," says Robb Report Health & Wellness Editor Janice O'Leary. "This year at our event, we're excited to introduce new ways for attendees to reach optimal wellness through the latest medical research, lifestyle changes, and cutting-edge technology. This is an opportunity to not just hear the talk about longevity but also walk the walk—literally." Robb Report's Health + Wellness experience will kick off with a welcome dinner and accompanying keynote on Thursday, March 15, in which Dave Asprey will dive deep into the concept of biohacking—techniques to drive self-improvement and transform your own health. Asprey founded Bulletproof after successfully biohacking his way to a 100-pound weight loss. With a mission to share his learnings with the world, Asprey's presentation will dig into this concept and provide attendees with tips to achieve their personal health and wellness goals. The following morning, guests will be greeted with a selection of wake-up wellness activities, ranging from morning meditations with expert Kelly Howell to sun salutations and beachfront workouts. A thought-provoking series of health talks will follow focused on hot-button topics presented by Dr. Donald Hensrud, medical director of the Mayo Clinic Healthy Living Program, followed by one-one-one health coaching with Dr. Param Dedhia, director of sleep medicine at Canyon Ranch. Afternoons will be filled with a number of intimate fitness offerings, among them stand-up paddleboard classes, training at Spartan Gym, and Robb Report–exclusive SoulCycle training at SoulCycle South Beach. Guests will enjoy a holistic approach to health and wellness throughout the entirety of the weekend, with healthy cooking classes from chef Matthew Kenney—the celebrated plant-based-cuisine chef and mastermind behind plnthouse, 1 Hotel South Beach's plant-based restaurant—along with relaxing spa treatments at Bamford Haybarn Spa and bio-organic wine tastings. To learn more about Robb Report’s Health + Wellness Summit and to register to attend, visit rr1.com/event/health-wellness, and follow @robbreport on Instagram with #RRHW2018. Want to make resolutions you’ll keep this new year? Think simple, sustainable changes. Follow these four steps for a healthier you, inside and out. After the holidays, the gym is filled with people who have resolved to incorporate exercise routines into their lives. Come February, the novelty of the new year wears off, life gets in the way and, according to “U.S. News & World Report,” 80 percent of resolutions fail by the second week of the month. Instead of jumping from no routine to a seven-days-a-week commitment, introduce workouts to your schedule in small doses. Dread cardio or weight machines? Find something that you’ll look forward to, like a cycling class, yoga or outdoor pursuits. Choosing activities that you enjoy will increase your chances of sticking to your resolution. According to the Centers for Disease Control and Prevention, most Americans are falling short of their fruit and vegetable intake goals, and most eat only half the recommended amount of fiber. To increase your consumption of essential nutrients, create a grocery list packed with fruits, vegetables, protein and whole grains. Plan meals for the week to ensure you stick to a whole-food menu. 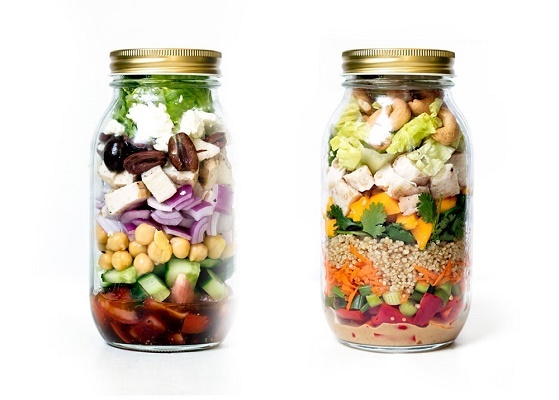 Keep ingredients on hand for meals you can make in a pinch, so you’re not tempted by fast food on a busy day. Try frozen salmon fillets, which you can cook without thawing, or eggs, low-fat cheese and veggies for a quick-baking frittata. 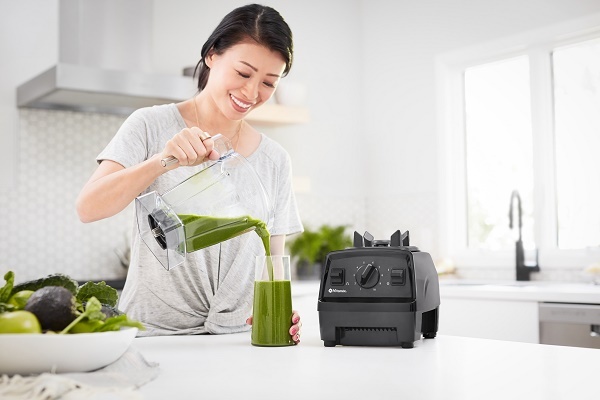 Freeze individual servings of chopped fruits and vegetables in resealable bags to create quick and delicious smoothies each morning in a high-powered blender, such as the Vitamix E310 Explorian Series machine. For a satisfying, energy-boosting snack, use your blender to pre-make Dried Fruit Chia Bars or White Chocolate Peanut Butter Energy Balls. Stress can have adverse effects on minds and bodies, as insomnia, weight gain, anxiety and depression are all potential related risks. While it isn’t always avoidable, simple changes will help you manage tension. Sometimes, stress can be solved with some “me time.” Treat yourself to a massage or manicure, soak in a hot bath, or unwind with a nature walk. Connecting with others can help, too. Plan a brunch with your best friend or a date night with your significant other. Feeling overwhelmed with work and family life? Build out a to-do list or calendar to feel more in control of your busy schedule, then cross items off the list when completed. A sunny outlook can affect your wellbeing. Keep a gratitude journal by writing down something good that happens each day. On bad days, you’ll be forced to focus on the positive aspects of your life. One of the best ways to improve your happiness is by giving others a boost. Volunteer with a charitable organization or donate to a favorite cause. Practice doing something kind daily. While most New Year’s resolutions are well-intentioned, sometimes they look better on paper than in practice, actually doing more harm than good. Here are five so-called “healthy” resolutions worth giving up in 2018, as well as better solutions. RESOLUTION 1: I’m going to take up permanent residence in the gym. Working out is an important piece of the weight loss puzzle, but moderation is key. Studies suggest that too much exercise can lead to a number of issues like hormonal imbalance, fatigue, insomnia and even depression. Many people also report experiencing a drastic increase in appetite after extreme bouts of physical activity, which can lead to overeating and negate the weight-related benefits. Plus, if you exercise so intensely that you’re injured or sore for days, it will be difficult to sustain this otherwise healthy habit. RESOLUTION 2: I’m saying goodbye to fats completely. Fatty foods have gotten a bad rap. The reality is there are good fats and bad fats. In humans, fat helps support normal growth and development, provides energy, allows for proper cellular function, provides protective cushioning for organs, and helps with absorption of certain vitamins. Bad fats are found in foods like meat, butter, lard, cream and trans fats (found in baked goods, fried foods and margarine) and can increase the risk of cardiovascular disease. Aim to replace these with good fats, which are associated with a decreased risk of chronic disease. 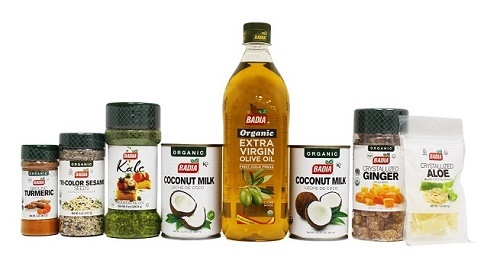 Good fats include plant-based oils like olive and canola, avocados, nuts, seeds, and dairy, since these also offer the nutrition your body needs. RESOLUTION 3: I’m going to skip breakfast to cut calories. According to The Academy of Nutrition and Dietetics, if you’re skipping breakfast, you’re doing something wrong. Research shows breakfast helps support brain function, energy and mood. And research suggests that people who eat breakfast consume fewer calories throughout the day, weigh less and have fewer risk factors for heart disease. Just a few reasons to load up in the a.m. RESOLUTION 4: I’ll just crash diet to lose the weight. Crash diets don’t work and many people who do them end up just gaining the weight back. RESOLUTION 5: I’m going to stop snacking. Snacks can account for more than a quarter of one’s daily calories. But if you munch on nutrient-dense foods (high in vitamins, minerals and fiber and low in calories), you’re more likely to maintain a healthy weight, according to the “National Health and Nutrition Examination Survey.” So, snack wisely. A busy lifestyle and cooler weather can take a toll on the body, especially for those who suffer from chronic aches and pains. Whether the cause of your pain is due to injury, stress, or poor sleep, there are many ways to feel better while avoiding future pain. To stay well this season and naturally manage muscle pain, consider these tips from professional ballroom dancer Tony Dovolani, who’s no stranger to the subject of pain management. STRETCH. Stretching is not just for before or after a workout. Stretch throughout the day to keep blood flowing, particularly if you have a job that keeps you sedentary. Figure out which vegetables you like best, and be sure to incorporate them into your diet. HYDRATE, HYDRATE, HYDRATE! Water is necessary for muscle repair. Drink water throughout the day and especially when you’re active. APPLY HEAT. Heat is a timeless remedy, and it’s clinically proven to relieve pain associated with muscle tension and stress, helping to relax muscles and improve blood flow. The increased blood flow restores oxygen and nutrients to inflamed areas to help accelerate healing. 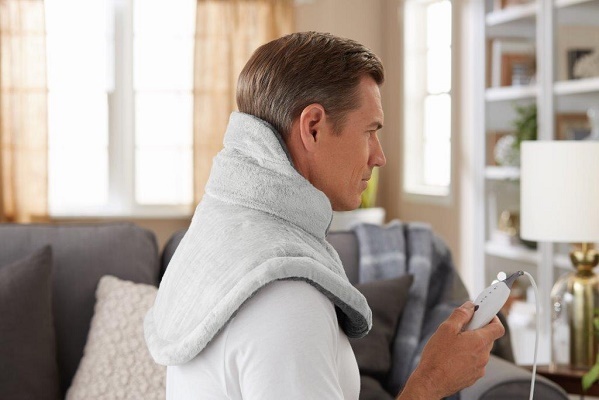 Because it features an adjustable neck collar that contours to the shape of the neck of the user, it can provide high-level, concentrated heat for targeted relief. Sometimes, we all just need a little inspiration to stay on-track to eat healthy meals, especially when life gets busy. With the holidays upon us, consumers are surrounded by more opportunities to eat decadent dinners and indulgent party appetizers. That’s why the Just Bare chicken brand, known for raising goodness by providing good food for more people, launched its Living Lean & Clean campaign. Featuring clean eating inspiration from Monique Volz, a health and wellness blogger and founder of Ambitious Kitchen, the Just BARE campaign offers consumers recipes for quick meals at JustBareChicken.com/Recipes. EAT HIGH-QUALITY FOOD: Clean eating is a great way to live a healthy lifestyle. It means making meals featuring ingredients that are fresh, all natural or organic. CHOOSE HEALTHY SNACKS: Don’t let between-meal treats spoil your routine. Strive to have healthy snacks on-hand, like Chicken Roll-ups. DON’T SKIP MEALS—EVER! Carve out time for meals, even on the busiest of days. Missing breakfast, lunch or dinner sets you up to be hungry, which can make it harder to avoid bad food choices. SIMPLIFY MEAL PREP: Make-ahead recipes, like Bento Boxes, ensure you always have rich, nutritional options, even when you’re on-the-go. ADD FLAVOR TO LOW-FAT PROTEIN: Protein can help you stay full longer and adding bold flavors to lean protein like chicken makes it as good for you as it is to eat. New Year’s resolutions can be a double-edged sword. While many of us feel inspired to make goals to improve our health, happiness and wellbeing, we often find the changes hard to sustain, and sometimes end up reverting back to old practices. Check out these tips for starting and maintaining a healthier lifestyle. Many people start a new year hoping to improve their fitness routines and eating habits, and quickly become discouraged when results aren’t immediate. Instead of cancelling your new gym membership and opting for a box of chocolates by Valentine’s Day, set achievable and realistic goals to stay on track. If losing weight is the objective, aim for 10 pounds instead of 50. If you succeed at losing the first 10, celebrate and make a new goal. Instead of adopting an extreme diet, cut back on one snack a day or incorporate a smoothie as a healthy meal replacement. Use ingredients like fresh fruit, dark leafy greens, flax or chia seeds -- even savory vegetables like beets -- the possibilities are endless. Sticking to fitness goals takes the right fuel. Eating whole foods instead of processed foods will give you more and longer-lasting energy. Plus, a whole-food diet is more simple and sustainable than restrictive calorie counting or elimination diets. Powering your body with snacks like low-fat yogurt topped with granola, fresh hummus and whole-grain pita, or an apple and peanut butter, will carry your body through a workout and help you feel fuller longer. To make delicious homemade nut butter, throw three cups of roasted, unsalted peanuts or cashews into a high-powered blender like a Vitamix machine and blend for a minute or so. The result is a gooey, good-for-you treat that will provide ample energy for healthy pursuits. While grocery shopping, stick to the outer perimeter of the store and pick up nutrient-rich and versatile ingredients like avocados, chickpeas, bananas, nuts and spinach, that can stand alone or be mixed into everything from healthy salads to frozen desserts. Being healthy and eating whole foods doesn’t mean you have to sacrifice your sweet tooth. Before you plunge into a tub of cookie dough, consider other ways to curb cravings. 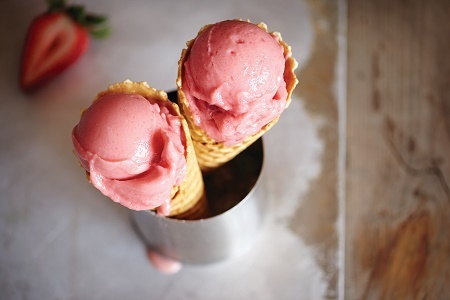 Make your own, customized whole-food ice cream without artificial colors, flavors or preservatives using a blender. Varieties like apple pie and spiced strawberry will delight without guilt. Or try a simple sorbet: blend two peeled oranges, two tablespoons sugar and four cups of ice. Use a blender with special settings for this purpose, such as the Vitamix Professional Series 750. Its Frozen Dessert program, one of the machine’s five pre-programmed settings, allows you to make an easy, healthy dessert in minutes. Looking for something that feels even more decadent? Find recipes like chocolate hazelnut spread and more at vitamix.com/Find-Recipes. For a healthier new year, focus on small, attainable goals, and use whole foods to get creative with your diet. This New Year, one important resolution is to focus on supporting a strong immune system for a happy and healthy 2017. “Building a strong immune system can improve and even extend your life,” says Larry Robinson, PhD, and vice president of Scientific Affairs, Embria Health Sciences, a manufacturer of natural, science-based ingredients that support wellness and vitality. For a healthier year, Robinson and the experts at Embria are encouraging people to toast to these great health and wellness tips. It’s easy to hole-up during these cold winter days, but it’s not very good for your health or immune system. Research shows that people that have more human interactions are better at combating cold weather challenges. So make sure to chat with your coworkers during the day and make plans with your friends after work. Not only will this boost your immunity, but social activities may also help reduce stress and depression. While a well-balanced diet of fruits, vegetables, and whole grains can support good health, getting the proper vitamins and nutrients in sufficient quantities every day can prove challenging. Consider resolving to offer your immune system targeted support with a supplement designed to boost healthy immune function. One of the best immune strengthening ingredients is EpiCor fermentate, which has been clinically shown to support the body’s ability to initiate the proper immune response when needed, support rapid immune response and maintain healthy immune function. You can find EpiCor in many popular and trusted supplement brands. Rest and relaxation can go a long way toward supporting good health. Ongoing sleep deficiency is linked to a number of major health problems and can impair the way your immune system responds, according to the National Institutes of Health. What’s more, too much stress can compromise immune response. 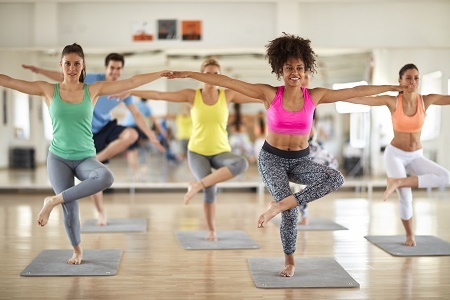 So whether it’s spending time with friends, going to yoga class or taking a bath, make sure your schedule includes time for both sleep and for stress-reducing activities. Improve your health from the inside out this New Year. By focusing on boosting your immunity as a goal, you will naturally adopt healthy habits. Wellness Corporate Solutions (WCS), the award-winning provider of employee wellness solutions, has announced the launch of the WellWork Kit: a new product line designed specifically for small businesses. The WellWork Kit closes this gap, giving smaller employers a straightforward, affordable way to promote health within their organizations. "We're truly excited to help small businesses bring wellness to their employees," said Leah Evert, Director of Products and Partnerships. "The WellWork Kit is perfect for smaller groups because it's economical, easy to implement, and engaging. Our wellness experts know how to create programming that generates excitement, and that's exactly what the WellWork Kit delivers." The WellWork Kit offers three programming options. The Basic level includes a comprehensive leadership guide, two turnkey wellness challenges, 12 months of on-site event ideas, yearlong subscriptions to two health education newsletters, and 12 months of client-branded marketing and communications materials. In addition to these features, WellWork Kit Digital adds an online wellness challenge platform with app and device integration. For small companies interested in a more comprehensive online solution, WellWork Kit Pro offers a wellness portal hosted in partnership with MeYouHealth. The WellWork Portal includes a simple health assessment, as well as open social-style challenges and campaigns that focus on daily wellness activities, exercise, and smoking cessation. It’s time for a time-out. With the hectic holidays upon us, getting the correct amount of relaxation is necessary to feel your best. Finding a way to let the day go can be challenging, as these days, it’s often difficult to find enough time to wind down. The world moves at a fast pace, and we all find ourselves moving faster just to catch up. This accelerated speed results in a more difficult time slowing down.
. Ear candling is a calming, holistic practice that is used to melt away stress and daily frustrations. The burning candle sends warm air and rhythmic sounds down through the hollow chute, massaging the ear canal via small vibrations, as the candle burns. Wally’s Natural Organic Ear Oil contains garlic oil, tea-tree oil and mullein extract to help support healthy ears, keeping them comfortable and soothed and avoiding agitation. To energize the body, using certified USDA organic ingredients, Wally’s Natural Organic Body Oil is rich in vitamins and minerals, creating a combination which will assist the drive of the formula down into the furthest layers of the skin, for an effect that lasts. 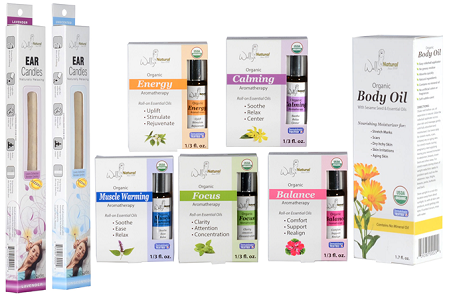 To focus on finding balance, calm, focus and energy, or to warm the muscles, Wally’s Natural Organic Essential Oils have eliminated the guesswork of creating the correct essential oil, with five pre-concocted blends.